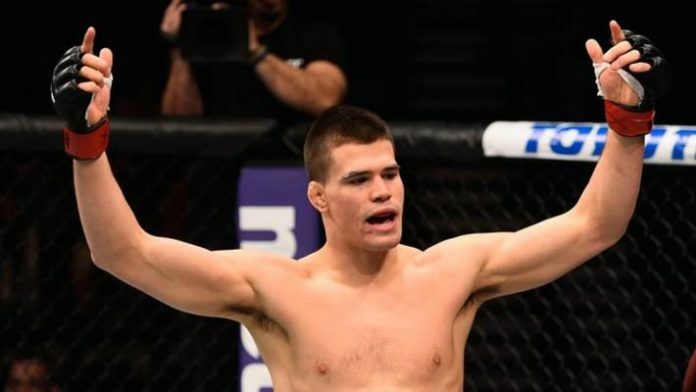 UFC has confirmed (via Journal Star) that Mickey Gall will return to the octagon to fight George Sullivan at the UFC Lincoln event on August 25 at Pinnacle Bank Arena. The main event will feature a lightweight bout between Justin Gaethje and James Vick. Gall is a young fighter with five fights in his professional career. This will be his fifth appearance in the octagon. Gall has won three of his four fights in the UFC. His recent match was against Randy Brown which he lost via unanimous decision. Before the Randy Brown fight, Gall had back-to-back wins over Mike Jackson, Phil Brooks aka CM Punk and Sage Northcutt. Gall is a BJJ brown belt under David Adiv and has been active in the grappling circuit before completely dedicating himself to MMA. His opponent George “The Silencer” Sullivan is a seasoned fighter and has way more experience than Micky Gall. George has 17 wins and six losses in his professional career and this will be his seventh appearance in the UFC. He has gone 3-3 in his UFC career and is on a two-fight losing streak. A win over Micky Gall will be a big confidence booster and would help him get some stability. Another exciting fight has been added to UFC Lincoln card. Iuri Alcantara will face Cory Sand Hagen in a bantamweight fight. Who takes it, Mickey Gall or George Sullivan?